This article will attempt to cover some important aspects to help you learn how to play blackjack. 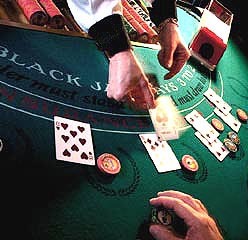 Blackjack is played at a table like the one pictured. Not only when learning how to play blackjack but also when you are an experienced player, you should always be sure to note the important rule information printed on the table felt and on the card next to the dealer. This information will tell you what type of game is being offered. Some casinos offer single deck games where the dealer actually holds the deck as she distributes the cards, but most casinos have multiple deck games. Two to eight decks are stored in a box called a shoe. The dealer pulls cards from a slot at the front of the shoe. A player’s cards are usually dealt face down in a single deck game. Multiple deck games can be either face up or face down. Your chances of winning do not change and are the same either way, although with the cards face up you do have more information about the cards that are in play and thus unavailable. The game begins when you sit down. Any seat is fine. You have an equal chance of winning at all of them. The seat to the dealer’s far left is commonly called first base. The seat at the other end of the table, the dealer’s far right, is third base. The terminology is of not important in the game, but it may help you when speaking with an experienced blackjack player. The next step in learning how to play blackjack is to know how the hand is dealt. To start the cards will be shuffled and one of the players will be allowed to cut the deck(s). In a single deck game, this is done by simply lifting a top portion of the deck and laying it next to the bottom portion. In a multiple deck game you will use a plastic card sized stop. Should you be asked to cut the deck you will want to put the card sized stop somewhere near the middle. The dealer will complete the cut, and then burn the new top card by discarding it in a tray or putting it face up toward the end of the deck. At this point it’s time to bet. You will place your wager in the circle in front of you; at this point you do not touch the chips again. Either you’ll lose them at the end of the hand or be given more chips by the dealer. Starting on her left the dealer gives one card to each player and then one card face up to herself. A second card is dealt to each player and the dealer receives another card called the hole card. This time it’s face down. You can see only one of the dealer’s card. Let’s say it’s a ten. Does the dealer have blackjack? Does the dealer have nineteen? Does the dealer have thirteen? If you have twenty-one or twenty it doesn’t matter you’ll stand and probably win or tie. But what if you have thirteen? Should you hit? What’s that other card? These are all questions beyond this how to play blackjack article and will be answered in another.